Find and book hotels in Orvieto. With location maps and guest reviews. Orvieto is a charming hill-town in Umbria, Italy, within easy reach of Rome. The town is in a superb defensive position, perched on top of a giant rock outcrop, and has a history that goes back at least as far as Etruscan times. Orvieto is a popular daytrip destination; the town is a manageable size and it's possible to see the major sights and appreciate the town without staying overnight. 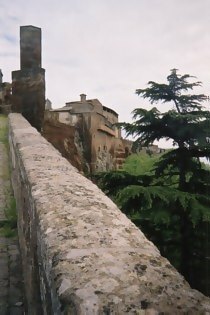 However, Orvieto's location on a major railway line also makes it a good base for a longer stay. Once the tour parties and daytrippers have left, it's possible to enjoy the peace and tranquillity of the medieval lanes, and enjoy long leisurely evenings feasting on the excellent Umbrian cuisine abounding in the town's many restaurants. A good first stop is the tourist office, opposite the Duomo in (naturally) Piazza del Duomo. Here you can pick up a town map, and buy tickets for the Capella inside the Duomo, and for tours. It's possible to purchase special combined tickets for several of the town's attractions. 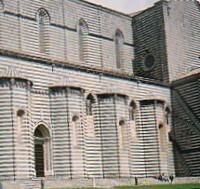 The thirteenth-century Duomo is Orvieto's most dramatic tourist attraction. A striking black-and-white creation, the cathedral features intricate carvings on the facade, and an atmospherically austere interior. In a chapel to the right of the main altar, the Capella di San Brizio or Capella Nuova, contains terrifying apocalyptic frescoes by Luca Signorelli. For the Capella, buy tickets beforehand in the tourist office. The tourist office organises fascinating underground tours (Viaggi nella Citta' Sotterranea). Orvieto is built on tufa, a volcanic rock which is very easy to dig into, and from the earliest times the hill-top dwellers dug downwards to extend their town. On the tour you can visit Etruscan underground 'rooms', with carved roof details, and see the deep wells dug by the Etruscan inhabitants to reach water. Later many caves were used for practical purposes, with underground mills and stables in use until recent centuries. Most fascinating of all are the underground columbariums, cut into the very edge of the hilltop, with 'windows' looking out from the cliff-face over the surrounding countryside. Here, in countless carved niches, the medieval residents of Orvieto kept pigeons. In an age when siege was a constant threat, these pigeons were a form of insurance for the populace. They bred frequently, flew out to find their own food, and provided meat and eggs in times of necessity. www.orvietounderground.it. Other underground explorations are the Pozzo della Cava, and the Pozzo di San Patrizio, two of the town's vastly deep wells, which the energetic can descend. Without leaving Piazza del Duomo you have the opportunity of visiting several museums, including the Museo Archeologico in Palazzo Papale, which is located (as the name suggests) in the former Papal palace, and contains artefacts including an entire Etruscan tomb. The streets of Orvieto are charmingly medieval, and away from the main tourist routes they are pleasantly peaceful. A tour around the edge of the town offers fantastic views over the surrounding countryside, and plenty of distractions like pretty churches and restaurants where you can enjoy local specialities such as truffles, and of course the wine Orvieto Classico. Orvieto is 100km from Rome on the main Rome-Florence railway line, and is well-served by trains. From Rome, the journey takes just over an hour, and you can choose from several different train types (and prices). More information on trains in Italy. There is also a bus service that runs from Rome's Stazione Tiburtina. The train station is in Orvieto Scalo, at the foot of the rocky hill which is crowned by the historic town of Orvieto. A funicular railway runs up the cliffs from outside the railway station - you can buy tickets at the station news-stand or in the funicular building. The service is frequent and takes just a few minutes. From the upper station of the funicular, you can walk up Corso Cavour towards the heart of town, or you can take a small bus that runs right to the Duomo. In Orvieto you have the choice between booking a hotel in the centro storico, or historical centre, and choosing a hotel in Orvieto Scalo, the modern part of town at the foot of the hill. The main railway station is in Orvieto Scalo; right outside Orvieto station a funicular railway connects you in a few minutes to the centro storico. It's quick and cheap to get between the two parts of town. The centro storico offers more picturesque surroundings; Orvieto Scalo is likely to be cheaper. > Advice on booking a hotel in Italy.